Last weekend me and Lee packed our overnight bags, dropped the kids off at their Nans and travelled to Formby Hall for a much-needed Spa Break. This trip was a fully paid in advance by me so just to clarify they didn’t know I was a Blogger and we received nothing extra than what we had paid for. 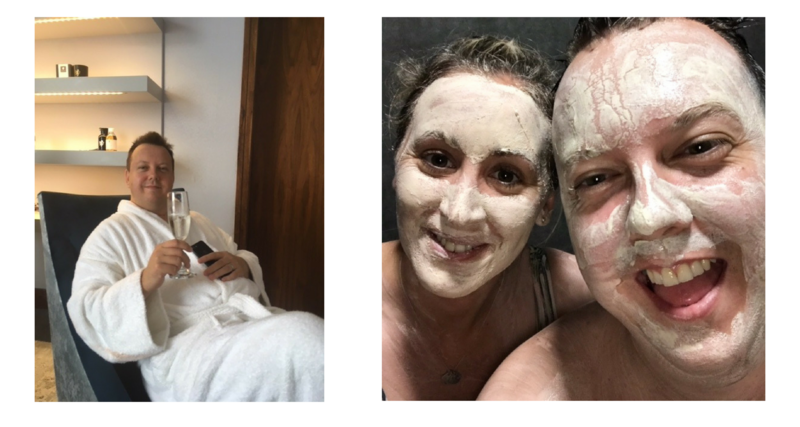 I booked us the Purity Spa Stay ( click here for details ) and added the Atlas Rasul mud steam room as an extra treat. In total including the weekend supplement, I paid £389.00. I know this sounds expensive but sometimes we all need a night away from the kids, a relax and most importantly a laugh with each other. 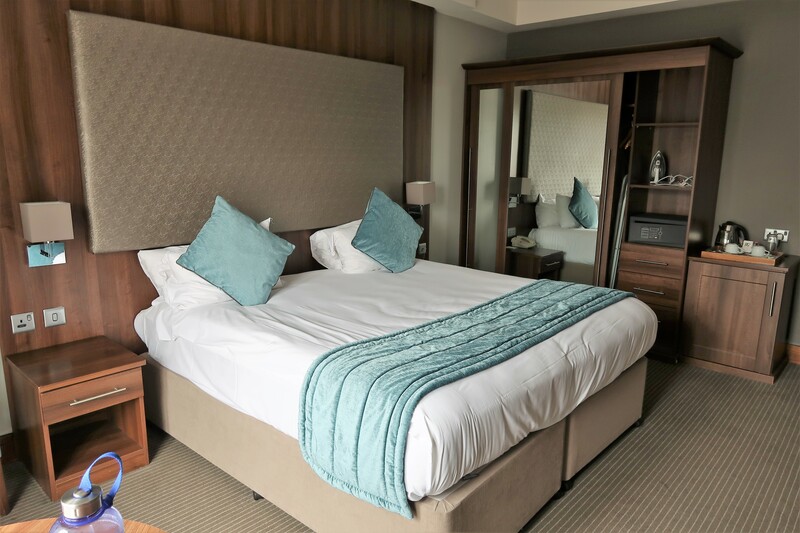 So let’s start at the beginning …..
We arrived at Formby Hall at 12.30 and were pleasantly surprised to find our room already available to check into. We were welcomed with a smile, the guy went over the package we had booked and told us we had 4 hours access to the spa starting whenever we wanted. We quickly went and put our bags in our Executive room which was very nicely presented and had lots of space. The description did say ‘Golf Course Views ‘ but our terrace looked out onto a very barren garden and fence ( but that just me being picky). All in all the room was very nice. We then went to have some lunch in the Fairway Bar, we could have gone across to the Spa Bistro but reception couldn’t clarify what type of food they served. The Fairway Bar has a lovely relaxed atmosphere and the food is very yummy. The downside of the Fairway Bar is it’s hard to get a drink, nothing to do with being too busy or lack of staff they basically just ignored anyone stood there while they chatted between themselves or disappeared in the back. This would be a running theme throughout our stay. Time to relax in the spa ?? Off we pop across the car park to the Spa building where we are met on the lower floor by 3 therapists all sat at a reception. After giving over our name therapist No1 asks how we would like to pay ?? I answered we had paid 2 weeks ago and I had the receipt here and she just looked back at me and said ‘that not what my computer says’ ( Yep this sprung to mind ) Anyway, after looking at my receipt all 3 therapists apologised and blamed the error on reception not updating the system. We then go upstairs to another reception manned by no less than 6 therapists who then couldn’t find our booking or the treatments we were having. Finally after being ‘found ‘ we were then asked if we would like welcome drinks in the Spa Bisto. The Bisto turned out to be a small very crowded room and the welcome drinks were warm orange juice. Keen to get onto the relaxing part we took one sip and returned to reception where we were both presented with plastic wrapped bundles with robes and slippers in. It kind of felt like we were having a prison induction carrying large plastic bundles to the changing rooms. Having been to many spas in my time I always know the changing rooms are little havens of luxury and to be honest the changing rooms were fitted out with lovely fixtures and fittings but sadly they were dirty and messy even at 2 p.m when I got there. No matter, we were here now and I was ready to start relaxing. No such luck. The pool area was overcrowded with far too many people so there wasn’t a lounger available to put our towels or robe down on. We ended up sticking everything in a corner and decided to have a little swim. It now makes sense to me why everyone was sat around the pool and not in it as it was freezing, like take your breath away freezing. With the small 4 man jacuzzi filled with people the whole time we were there, we choose to try out the different experience rooms. Once again they were rammed with people. We finally found a spare space in the Tranquillity Suite and spent most of our spa visit laying on our backs playing on our phones and listening to audiobooks. We did indeed get lots of rest as laying there with nothing else to do and laughing at our Faulty Towers Spa trip was very therapeutic. I early mentioned we had booked 2 spa treatments for our trip. The first was the Atlas Rasul mud steam room . You have a private steam room all to yourself 2 big pots of infused mud and you basically cover yourself ( or each other ) in the mud, sit back in the steam room and relax while the mud and the steam work wonders on your skin. 100% if you ever go to a spa with your partner, book this treatment. It was serious fun coating each other with mud and very romantic is a mucky* way. Our 2nd treatment was a couples massage but while we waited for the hour between treatments we decided to go back to the Spa Bistro for a glass of Prosecco. We heard the cork being popped in the backroom and then our £8.00 glasses of prosecco were served to us lukewarm like the bottle had been kept on a radiator. My request for a few ice cubes was met with a very put-upon face and a finger that pointed to the door to say we would have to drink our ice-filled prosecco in the spa reception. Our 25 minutes tension messages were booked in for 5.30 and it was lovely when they said we would be having them together in the same room. The therapists showed us the room, told us to strip to our waists and lay under the towels. On entering the room all I could smell was eggy trumps. Thinking it was Lee I told him off, Lee mortified told me it wasn’t him and on closer inspection of the in-room shower found our culprit coming from the plug hole. I politely asked the Therapists if there was something they could spray as it ‘smelt a little’, both apologised and advised us it had been like that all day and they had tried putting bleach down it. We compromised by squirting essential oil on our towels before laying face down. I can’t fault the massages, both therapists did their jobs well and with the exception of the not so nice smell coming from the drains, it was a lovely treatment. When the 25 minutes were up the therapists told us to take our time and they would meet up outside the door. We both sat up popped our dressing gowns on and walked out but no therapist. Lee joked that it was 6.03 and I bet they both finished work at 6.00. I really just wanted to go and have a polite word with one of the Spa Managers about the day and our disappointment but there was no one in sight. When I went back down to the changing room it looked like a bomb had hit it, there were old wet towels and robes all over the place. 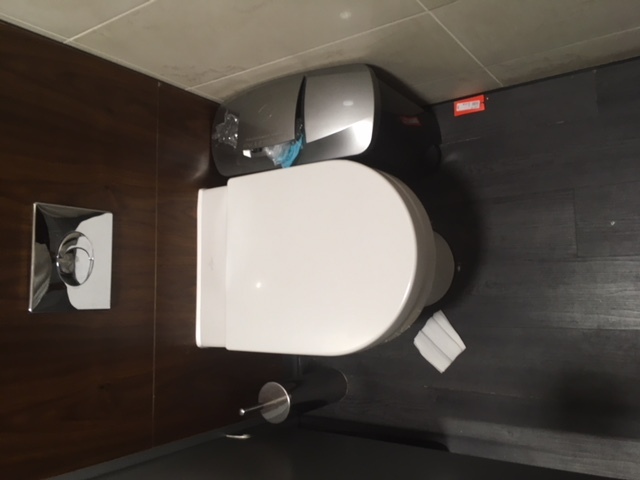 The toilets were disgraceful with overflowing sanity bins and toilet paper all over the floor. Hand on heart I don’t think the changing room had been cleaned since I arrived at 2p.m. With over 10 therapists/ staff stood around chatting at most points of the day they were not understaffed. The staff were just not doing anything and the state of the facilities showed this quite clearly. We were determined to enjoy our break together so we ordered a bottle of champagne from the bar along with a huge bucket of ice and 2 glasses and took it back to the room to sit on the terrace with. We relaxed and enjoyed a couple of hours of peace before I went back in to have a shower. Slight issue, no towels in the room. I called reception who advised me to check the wardrobe, behind the door and next to the bed but after we had exhausted all avenues she just said ‘ no clue then? ‘. I said could she maybe get housekeeping to pop us some, to which she agreed and housekeeping turned up 1/2 hour later. By the time we got to the Fairway Grill for our 8.30 booking I really wasn’t holding up much hope for the rest of the evening, but after checking they had a large stock of Hendricks Gin I settled that if the food was crap I could at least get drunk in style. 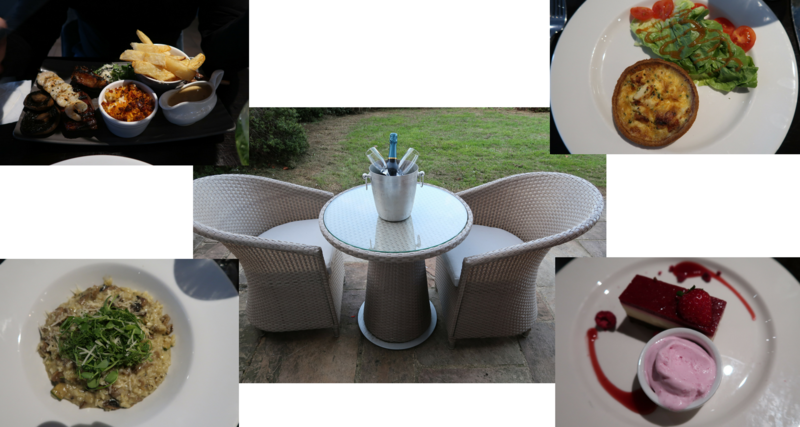 As part of the package, you have a 2-course set menu to choose from or a £18 credit to use on the à la carte menu . I choose the goats cheese & Parma ham tart followed by the Risotto and Lee had the Pâté followed by a mixed grill ( which he paid extra for). The restaurant, staff and food knocked it out of the park. I can’t compliment enough the food or the lovely girl who served us. I don’t think she will have realised it but she made our very disappointing day a hell of a lot better. She went above and beyond to make sure we had a nice meal and recommended what puddings for us to try. When we finished the meal we sat back in the bar and watched the band that was on. We were fast asleep in bed for 12.30 and had a very good nights sleep in a very comfy bed. 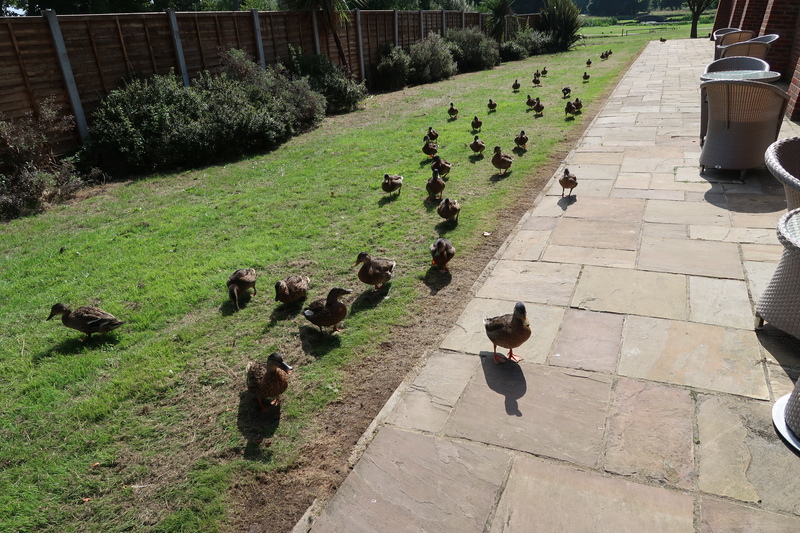 The next morning while enjoying a coffee on the terrace we were greeted by 30-40 ducks looking for their breakfast which was a very nice way to start the day. Breakfast too did not disappoint and the same waitress that had served us the night before once again made sure we had everything we needed. In total including the price of the Spa break, lunch, drinks and supplement for the evening meal we paid £539.00, I can’t fault the room ( except I like towels inc), the food was amazing and the hotel and scenery is beautiful. The treatments at the spa were very nice but the Spa facilities, cleanliness and the amount of staff who just stood about chatting was a real letdown. I am gutted and have so far not mentioned these words but Ribby Hall is far, far superior to Formby Hall. 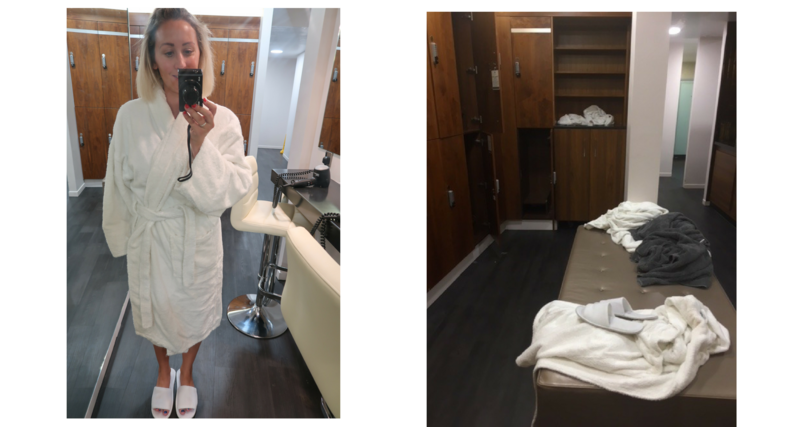 I found myself comparing the 2 spa’s most of the day and it became very clear very quickly Formby Hall is not a patch on other Spas like Ribby & Stanley House. The really annoying thing is that Formby Hall has all the makings of a 5-star spa break but the spa staff and dirty environment let it down. So no I won’t be returning and no I wouldn’t recommend having a spa break there. It was still a break from the kids but not worth the money I paid. 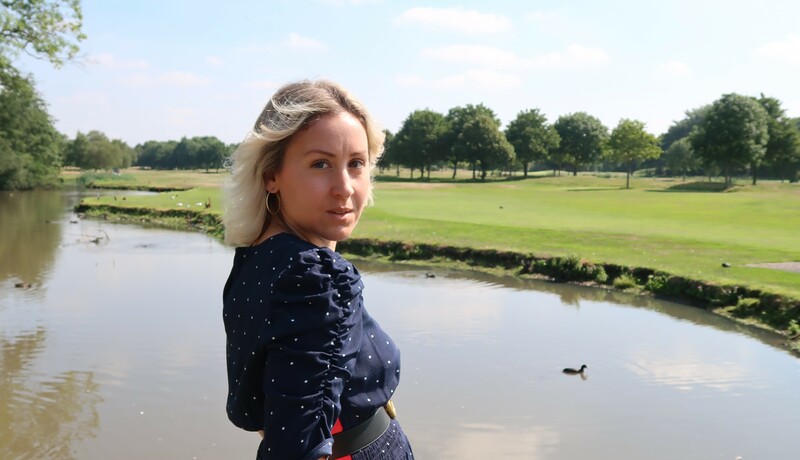 "The Marks & Spencer ‘It’ Dress"